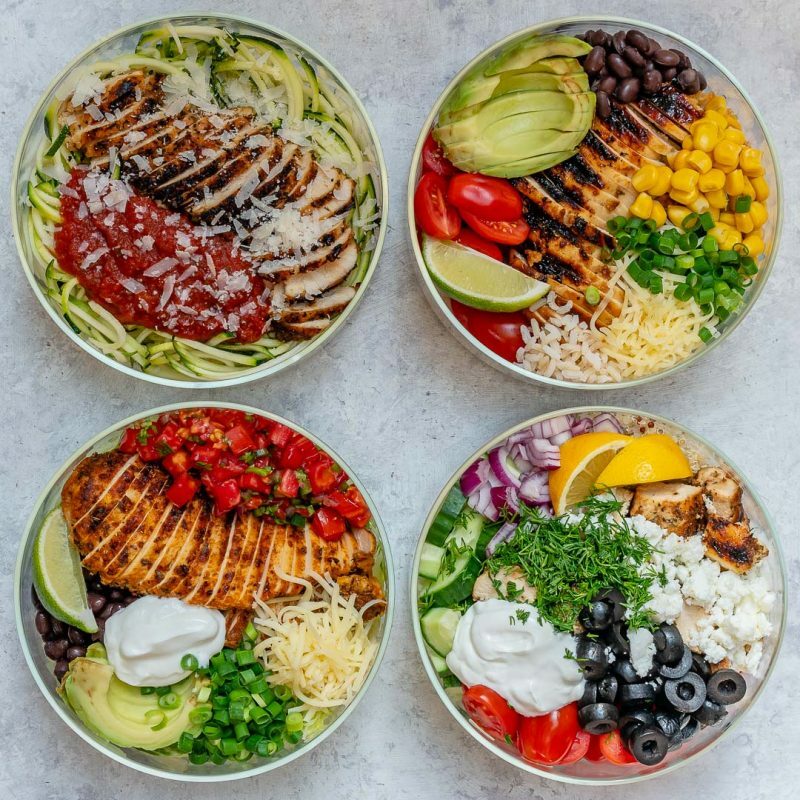 Grilled Chicken Meal Prep Bowls 4 Creative Ways for Clean Eating! 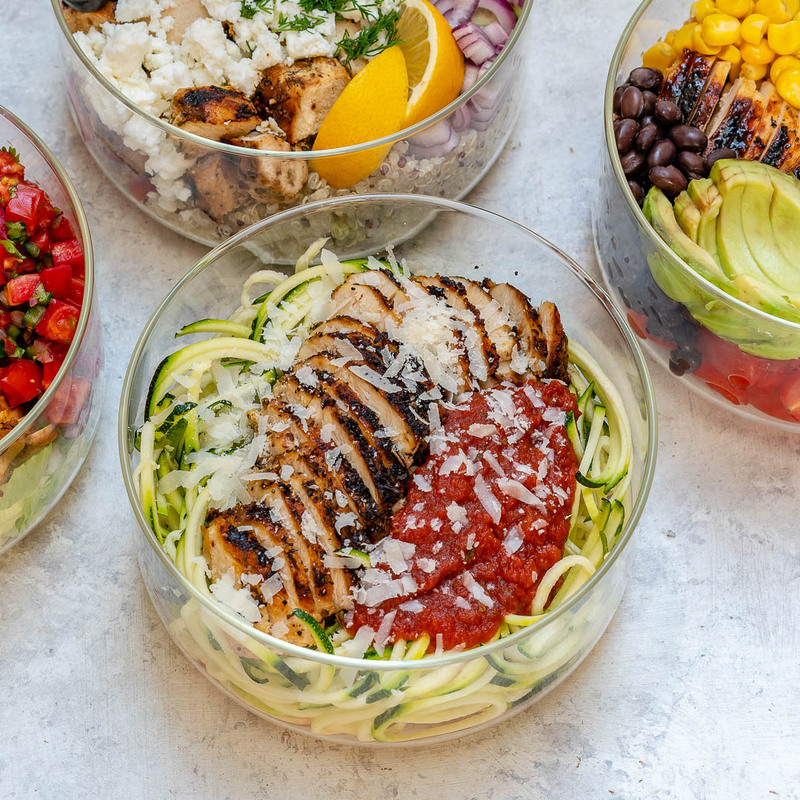 Ready to work your meal prep muscles!? These are SIMPLE, SO TASTY and Clean Eating Approved. 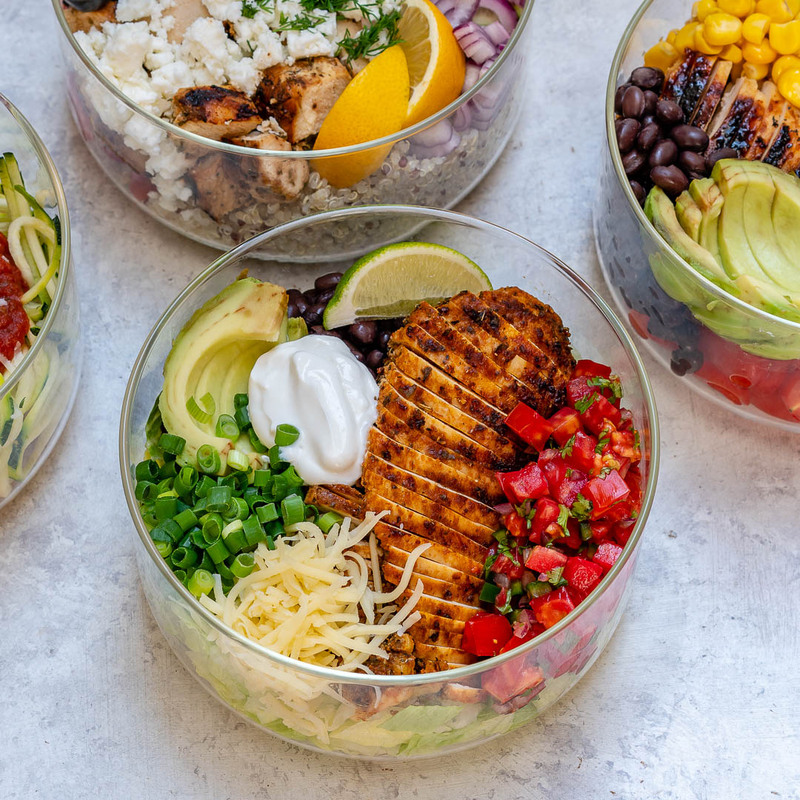 Delicious Meal Prep Bowl idea #1 of 4 coming at you now! 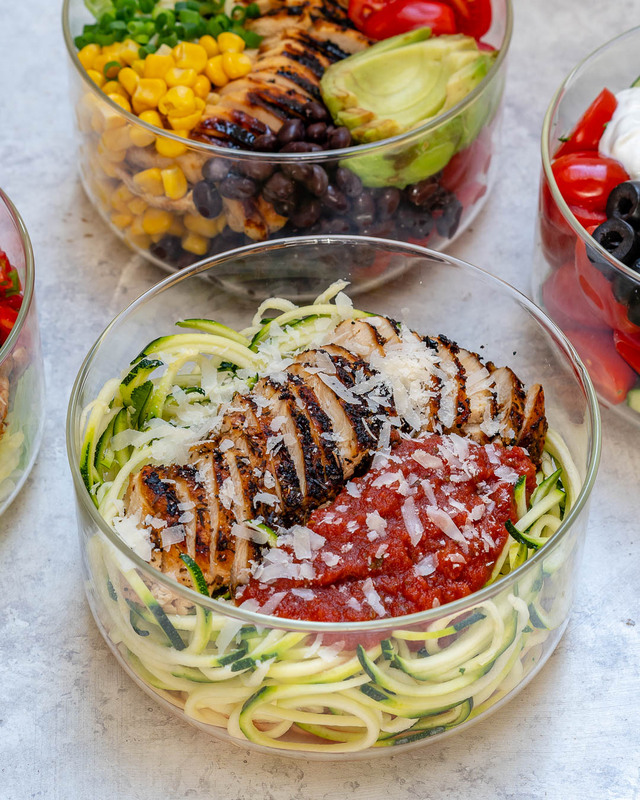 Read the recipe for my tips to PREVENT zucchini noodles from becoming soggy. 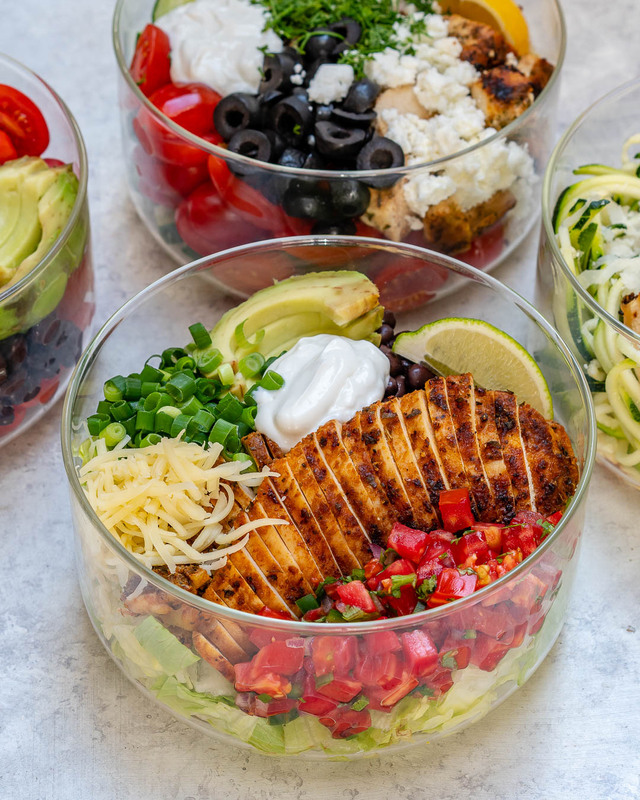 Place chicken together with the marinade ingredients in a small Ziploc bag, or glass bowl. Seal bag while pressing the excess air out, or cover glass bowl with lid or plastic wrap. 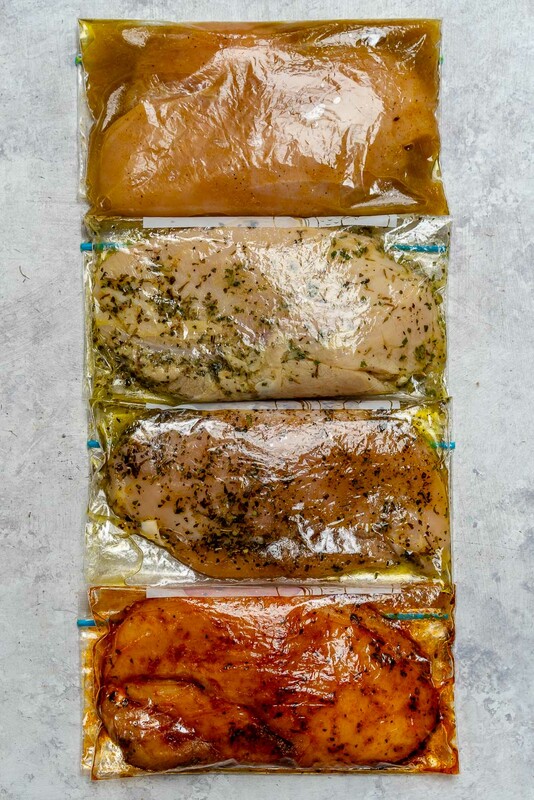 Rub marinade into the chicken then transfer to refrigerator and allow marinate at least 30 minutes and up to 6 hours. 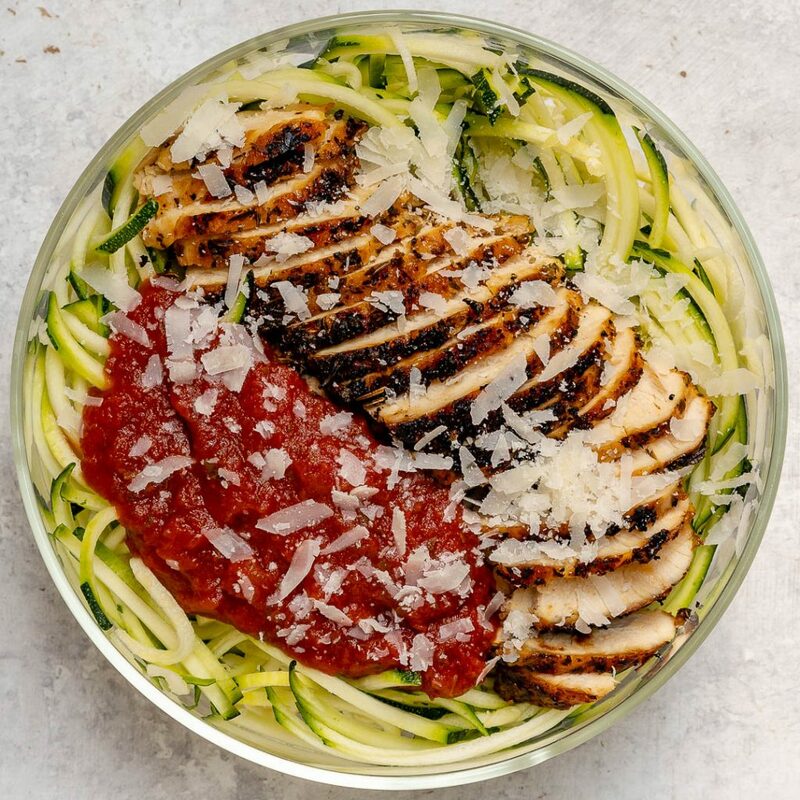 Spiralize zucchini using a noodle blade ( cleanfoodcrush.com/spiralizer ) then add to a colander set on top of a large bowl to catch moisture. Very lightly sea salt then toss to coat. Cover with a paper towel then place in the refrigerator for 30 minutes to drain excess water. Meanwhile, preheat grill to medium-high heat. Carefully brush grill with a bit of avocado, or olive oil, don’t burn yourself! 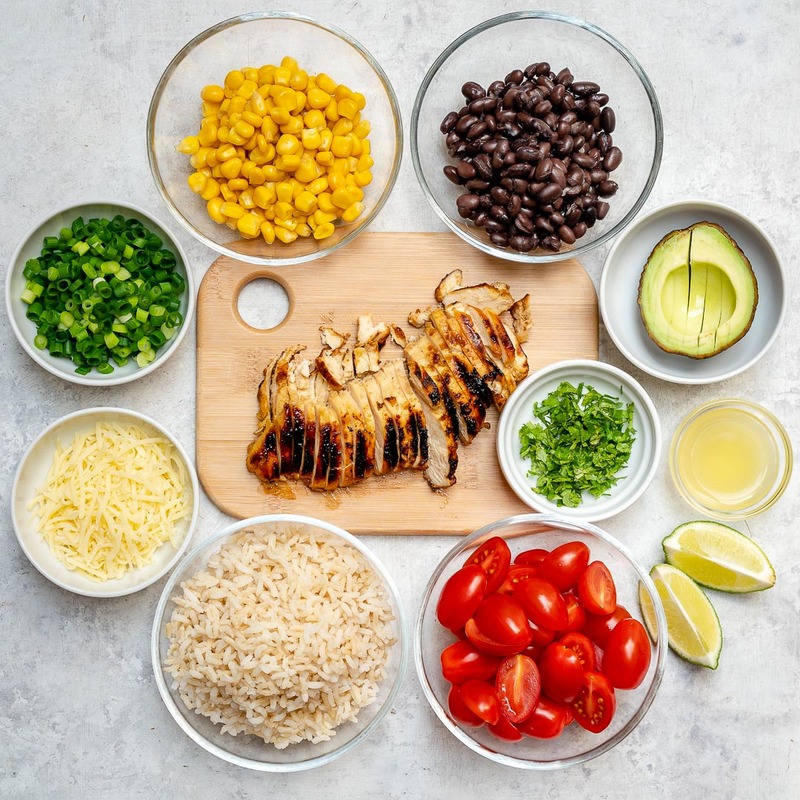 Place chicken on the grill and cook for about 4-5 minutes per side or until cooked through and no longer pink in the inside (internal temperature to reach 165 degrees). Allow chicken to rest 5-10 minutes before slicing. 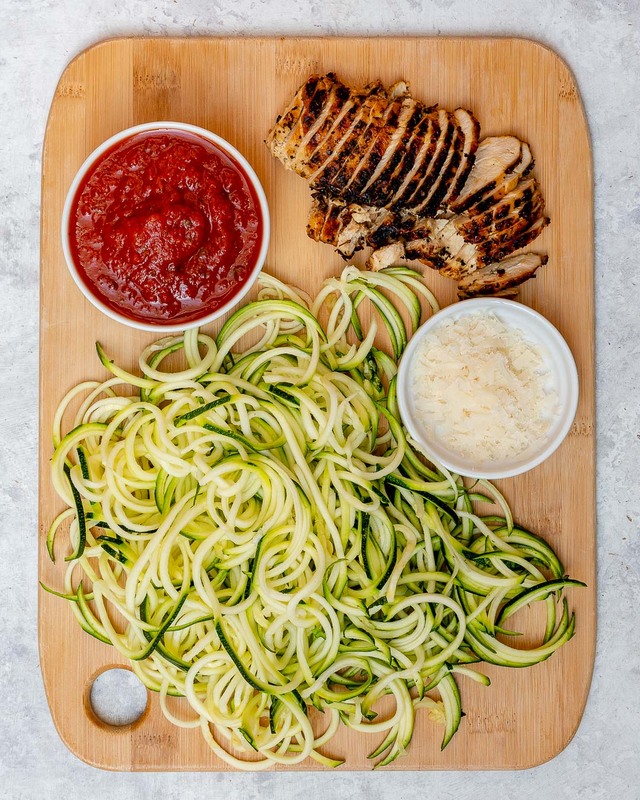 Meanwhile, remove zoodles from the refrigerator and gently pat dry with paper towels. Serve immediately, or store in airtight containers in the fridge. Refrigerate for up to 3 days. When ready to serve just microwave 2 minutes and toss to combine. #Planning always wins over-relying on #Willpower 🏆 Seriously! People who plan + prep their meals ahead of time are twice as successful with their goals! 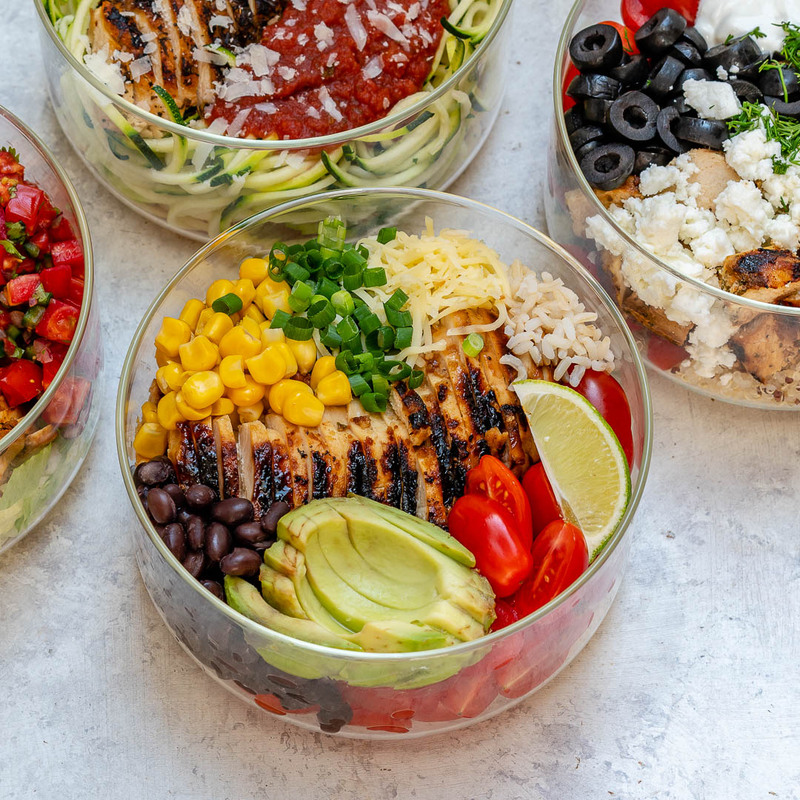 #MealPrepSuccess It sure helps when it’s #Simple & #Delicious too! Place chicken together with the marinade ingredients in a small Ziploc bag or glass bowl. Rub marinade over chicken then seal bag while pressing the excess air out, or place a lid or plastic wrap over the bowl. Transfer to the refrigerator and marinate at least 30 minutes or up to 6 hours. Carefully brush grill with a bit of avocado oil or olive oil; don’t burn yourself! 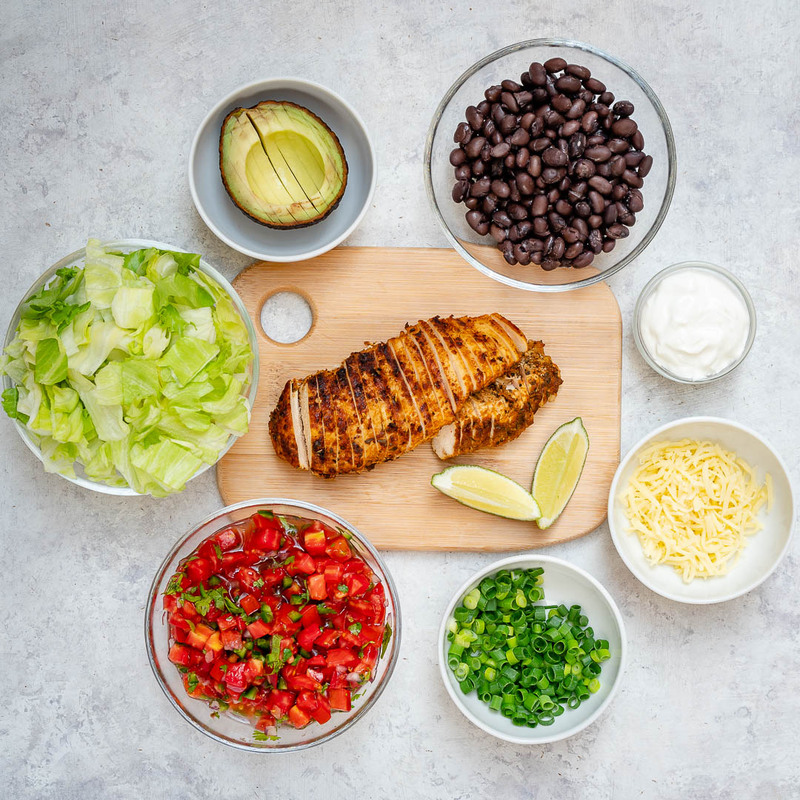 Place chicken on the grill and cook for about 4-5 minutes per side or until cooked through and no longer pink in the center (the internal temperature has to reach 165 degrees). Allow chicken to rest for 8 minutes, then dice. 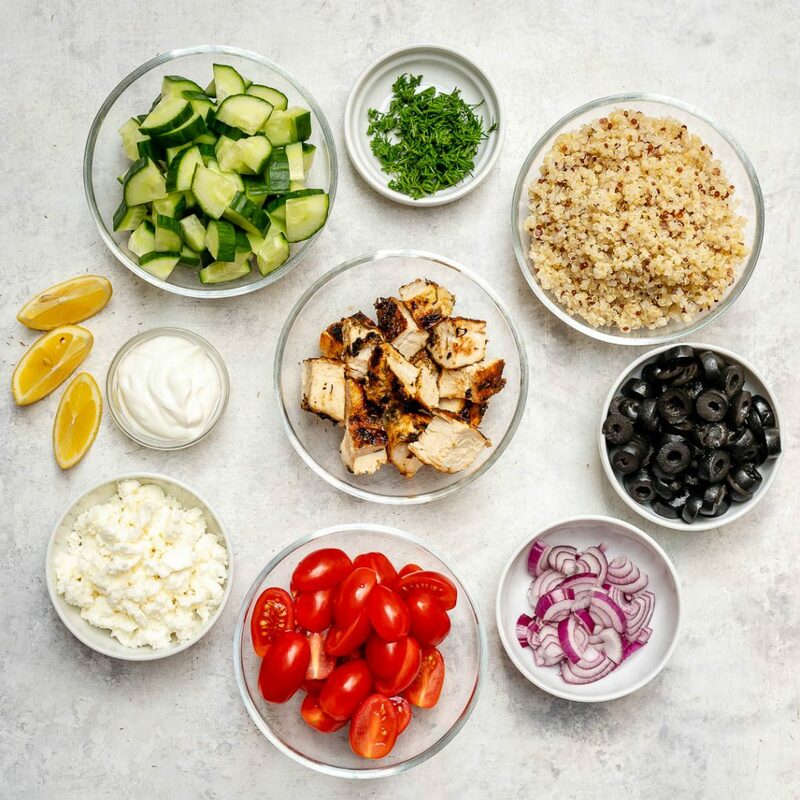 To assemble the bowl, add a layer of quinoa at the bottom. 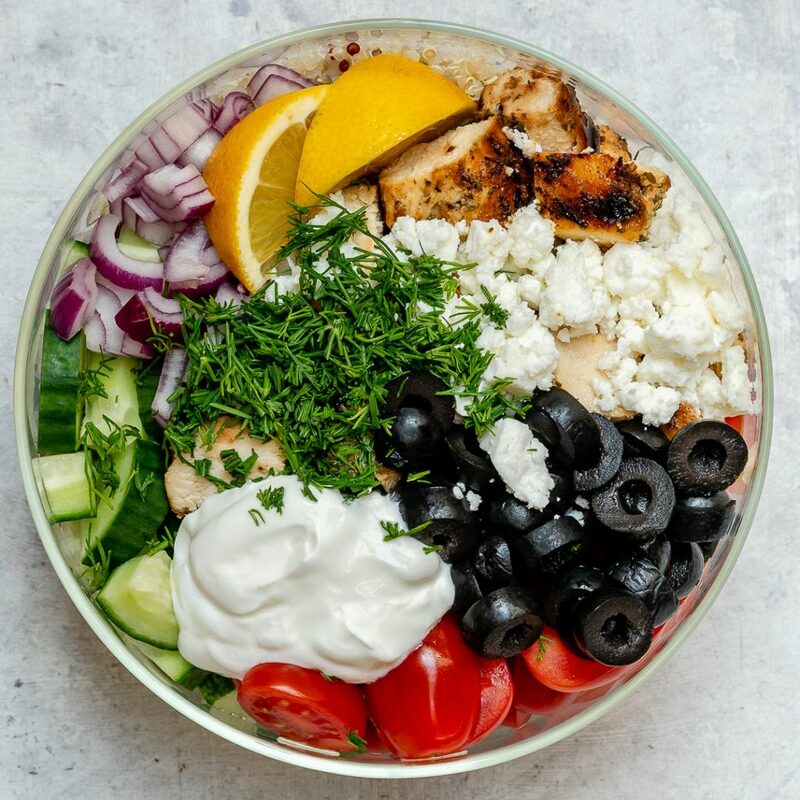 Top with chicken, tomatoes, cucumbers, onions, feta, olives and yogurt. Serve warm or cold. Serve immediately, or refrigerate, sealed well for 3-5 days for meal prep. 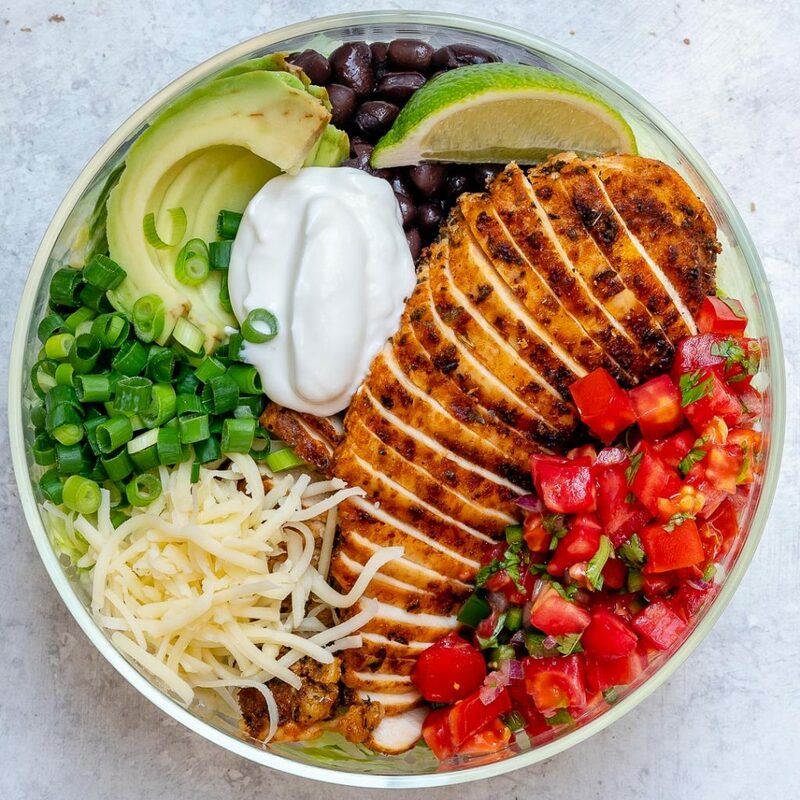 Get festive with this delicious burrito bowl! Another #MealPrepSuccess! These will make you wish every day was Taco Tuesday! Allow chicken to rest for 8 minutes, then slice against the grain. 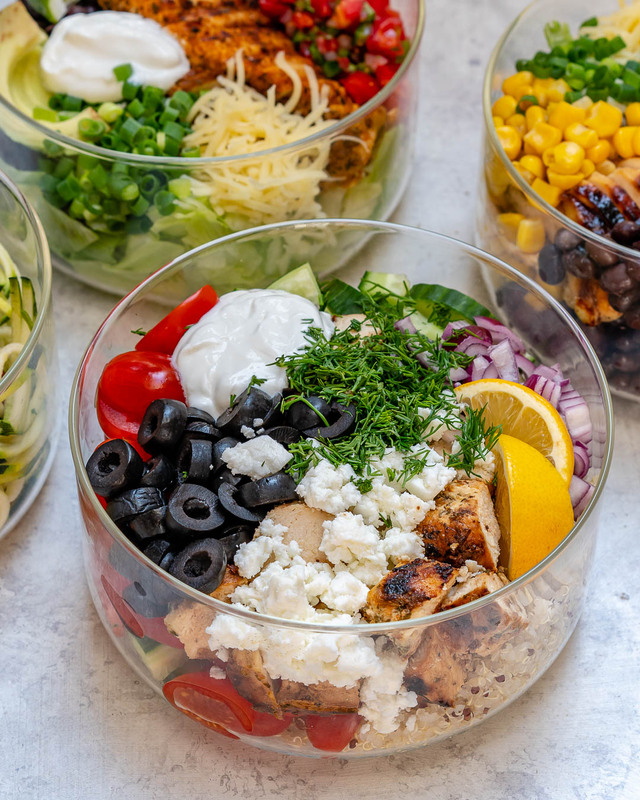 Assemble all salad ingredients nicely, as shown, in a large glass bowl or container. Serve immediately, or seal tightly and store in the refrigerator for up to 3-5 days. I prefer to add the avocado, & Greek yogurt right before eating. Get ready, here come’s #4! 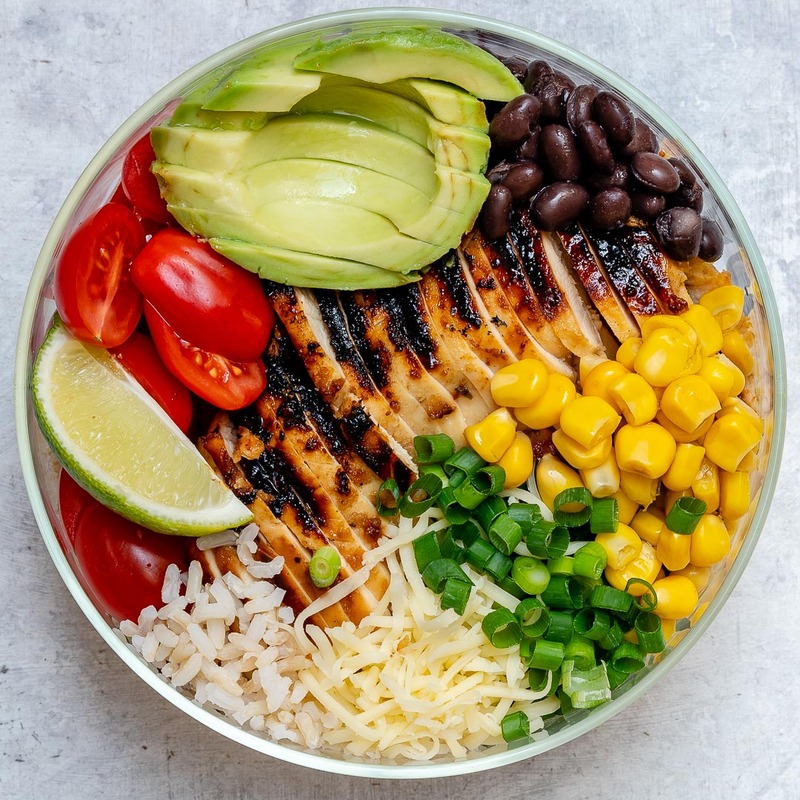 🍅🌽 Delicious Meal Prep Bowl idea #4 of 4 coming at you now! People who plan + prep their meals ahead of time are twice as successful with their goals! #MealPrepSuccess! Allow chicken to rest for 8 minutes, then slice. Meanwhile, stir the chopped cilantro, and fresh lime into your brown rice. 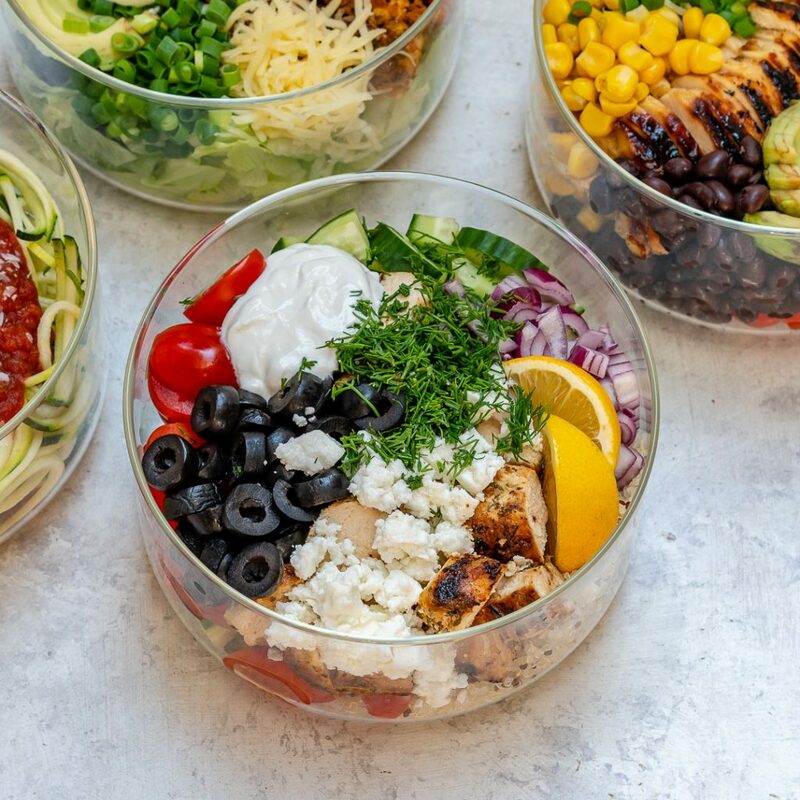 Assemble all salad ingredients as shown in a large glass container, and serve, or refrigerate, sealed well, 3-5 days for food prep. Meanwhile, preheat grill to medium-high heat. Carefully brush grill with a bit of avocado, or olive oil, don't burn yourself! Carefully brush grill with a bit of avocado oil or olive oil; don't burn yourself!